54 pages. 19 color/6 black and white reproductions. Hardcover with dust jacket. 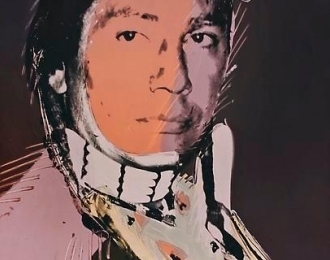 Published on the occasion of the exhibition The American Indian: Paintings and Drawings by Andy Warhol. This is how it happened. An art dealer holds the exclusive rights to Andy Warhol’s works on the West Coast of the United States. He wants to put something really interesting on the market. Somebody in his gallery suggests as subject the Indian. A quick survey among the tribes in California produces the name of Russell Means: he is the most representative. He agrees to travel to New York where Warhol takes pictures of him. The gallery offers Russel Means $5,000 which are donated to the Movement of the American Indians. So, this is the material for the series called “The American Indian.” It consists of twelve large paintings, 24 smaller paintings, and a number of drawings, all of them dated 1976. Text by Rainer Michael Mason.